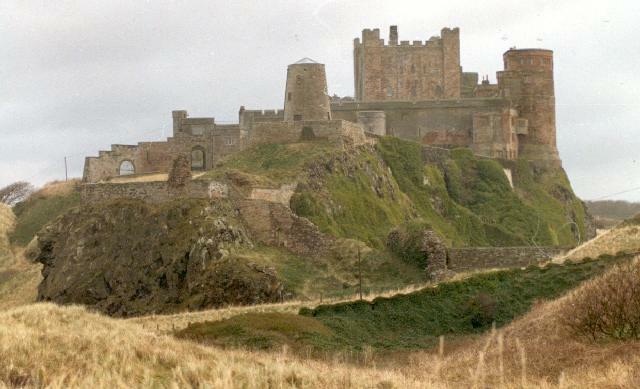 General view of Bamburgh Castle. The coastal village is dominated by the spectacular bulk of Bamburgh Castle which sits on a long-narrow outcrop of rock. From the castle it is possible to see across the surrounding sand dunes to Holy Island. Although the castle is such a significant element of the landscape of Bamburgh we have to turn elsewhere to find the earliest remains of human activity in Bamburgh. The earliest traces take the form of scatters of flints dating to the Mesolithic period. These belong to a period before farming had been introduced, and these objects were probably the remains of a temporary camp for a small group using the coastal area as a source of food. They could have caught fish from the sea, picked shellfish from the beach or hunted wild birds amongst the shore and sand dunes. These people probably did not have permanent settlements, but moved around the countryside using different sources of food according to the season. The first permanent occupation probably began in the Neolithic period. Little evidence from this period has been found in Bamburgh. The only objects found so far are stone axe heads from Bamburgh Castle and Glororum. These may have been used to cut down timber, possibly to built houses or other structures. They also may have had a ritual purpose; as such axes were treated with great respect in the Neolithic period and could often be traded long distances. As with the other prehistoric periods there is relatively little evidence for the Bronze Age at Bamburgh. The notable exception is a large mound near Quarry Cottage. This monument was found to contain a stone-lined grave and the remains of a pottery vessel. The grave contained the bones of a man around 1.7m high. Burials in mounds such as these are typical of this period, and are often found in groups so it is possible that there may be other Bronze Age remains still to be found in Bamburgh. There was certainly occupation on the site of the castle in the Iron Age, though its precise nature is not clear. Excavations found layers of broken pottery of this date, though no structures were found. It is possible that the rocky outcrop was used as a hillfort. Unfortunately the later castle buildings have probably destroyed most traces of this early occupation on the site. It is likely that this activity continued into the Roman period. Such a spectacular site as Bamburgh may have been the home to an important tribal leader. However, archaeologists have yet to find any evidence dating firmly to this period. By the sixth century we know from the writer of a text called the 'Historia Britonum' that Bamburgh was an important regional centre and probably the main stronghold for a local king. At this time the Anglo-Saxons had not yet conquered this part of Northumberland and the site was known by its old British name of Din Guyardi. A burial site, probably belonging to this period has been found nearby in the sand-dunes beneath the castle, it may have been where the chief of Din Guyardi was buried. The castle at Bamburgh was finally captured by the Anglo-Saxon king Ida in AD547 and it became an important centre for the king. In AD615 the site was renamed Bebbanburgh (Bamburgh) after the wife of King Athelfrith. A fragment of an Anglo-Saxon stone throne was found at the site. These are very rare and only two others are known from Britain: one from Hexham and one from Beverley (East Yorkshire). The site at Bamburgh remained important throughout the Anglo-Saxon period and into the Norman period (1066 and after). It was a site of conflict in 1095 when William Rufus besieged a rebellious lord there, and built another castle, known appropriately as Malvoisin (`bad neighbour' in Norman French) to watch over the enemy stronghold. The area swung between Scottish and English rule and it may have been the Scots who begun work on the medieval stone castle that can be seen today. The English continued to build it when they recaptured the area. The site was much added to in the medieval period, but by the early 18th century when Lord Crewe, the Bishop of Durham, bought the site the site was in ruins. The castle was not the only part of medieval Bamburgh. To the west of the castle, close to the farm at Newtown, was the site of Warenmouth founded as the port for Bamburgh in 1250. It declined in the mid-15th century, and fell out of use. Nearer to the castle, in the village of Bamburgh, a friary was founded in 1265. A leper hospital was also sited near the village. The church of St Aidan was mainly built in the early 13th century, though an earlier church must have existed at or near the site. It is also possible that the thickened area of wall along the outside of the churchyard may have been part of a fortified tower, belonging to the Master of Bamburgh', the head of a small group of Augustinian monks living nearby. After Lord Crewe died he left the castle in his will to charity. In 1757 Dr Sharpe, the trustee of the charity began a programme of restoration. Much of the castle was made inhabitable again, and even a windmill was built at the west end of the castle. Amongst the schemes run from the castle were schools, a sick room, a library, accommodation for shipwrecked sailors and even a lifeboat. The windmill was used to grind corn to sell to the poor at special low prices. Much of parish relied on agriculture, and a number of typical Northumbrian farmhouses can be seen, such as Glororum Farm. The only evidence for any kind of industry is a number of lime kilns, which were used to burn lime to improve the quality of the soil. Although the area was mainly a backwater in the 18th and 19th century it briefly saw fame in 1838. Grace Darling and her father rescued many people from the sinking ship the SS Forfarshire. Grace became a celebrity, but died young and was buried at St Aidan's Church in an elaborate tomb. The castle fell into disrepair again in the 19th century. It was sold to Lord Armstrong who restored the castle, though he did not live to see the completion of the work. The castle is now open as an important tourist attraction bringing many people into the village. The castle also houses a museum about the life of Lord Armstrong. The castle has long been the site of archaeological exploration. After an initial period of excavations in the 1970s a new series of work is being carried out at the beginning of the 21st century aimed at uncovering new secrets about the past of one of Northumberland's most important archaeological sites.